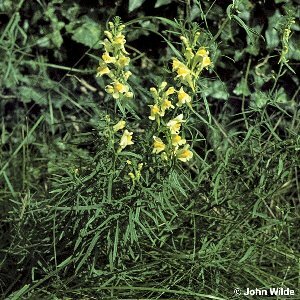 A yellow-flowered toadflax of roadsides or rough ground, frequent in the south and east. The plant reaches about 2 ft (60 cm) in height, has very narrow leaves and a spike of spurred yellow flowers, larger than other wild Linaria species. All names: Linaria vulgaris Miller; Linaria linaria (L.) Karst.